Every year around this time, our local Fire Brigade prepares for the fire danger season. We all rely on these amazing volunteers – they come out and fight fires even on Christmas Day! Fire Season 2018-19 begins at 1 am on Monday October 15th. There’s a lot each and every one of us can do to keep safe – to help prevent fires from starting, and to stay aware of when extra care is needed. If you need to report a fire: Call 000. The emergency services will call our local brigade out, as well as any other brigades nearby that might be needed. The VicEmergency web page, and the related phone app, are useful tools to help you see what’s happening in the area and getting notifications of incidents that might affect you. Go to emergency.vic.gov.au to create a login, which you can then use on the VicEmergency phone app to create a watch zone and receive alerts. If you hear the fire siren: don’t worry. The Fire Siren sounds to call our local brigade out, and it might go on for some time since some members live quite a distance from town. It isn’t a warning, and it isn’t an evacuation siren. If there’s a major fire and people need to evacuate, there will be a door-knock – you won’t be left wondering. The CFA works closely with Vic Police and other agencies to make sure people are safe. In Woomelang, we would evacuate to the Football Oval. Call 000. Tell them WHO you are, WHERE you are and WHAT you can see. You might be the first to report, which is great! But they won’t mind if you’re the 50th caller to report, because it’s better to get multiple reports than none at all. If you aren’t sure, call the Vic Emergency Hotline on 1 800 226 226. They can tell you about fires or planned burns in the area, plus lots of other fire-related information. If you have a CFA fridge magnet with a different number, don’t worry – the numbers on those magnets still work, as they are diverted automatically to the new number. We’ll be giving out new fridge magnets with the new number as soon as they’re ready, but you can still use your existing ones in the meantime! If the smoke is off to the side of the road, it could be quite a distance away. If you drive for 3 or 4 kilometers and it’s still in the same relative position, it’s a long way away. Call the Vic Emergency Hotline to check what it might be. During Fire Season, restrictions are in force. Check here for what this means to you. Plan and Prepare: This CFA page shows you how to be prepared for fire, whether it’s a house fire or a bushfire. Make sure you’re ready for anything, and that you know what to do to protect yourself. As part of your plan, you could think about what you would need to pick up quickly in case of an evacuation; how to make sure your pets are safe; how you would leave the house; how you would make contact with friends and family once you are safe. 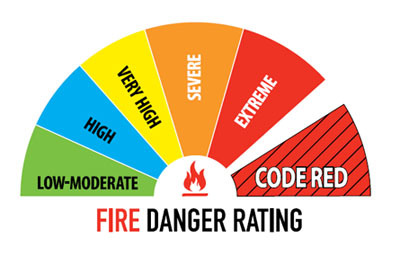 Fire Bans and Danger Ratings – this CFA-maintained page gives the fire danger ratings for the next four days, so you know what to expect and can plan. It also tells you when there’s a day of Total Fire Ban coming up. Can I or Can’t I? – Check out this page to know what you can and can’t do on Total Fire Ban days and during fire restrictions. Warnings and Incidents – this page at emergency.vic.gov.au lets you see if there’s any fire or emergency activity near you.